Thursday January 31, 2019-Self-proclaimed National Resistance Movement general, Miguna Miguna, has revealed that National Super Alliance (NASA) leader, Raila Odinga, was planning to cripple President Uhuru Kenyatta’s government once he was sworn as people’s president on January 30th, 2018. 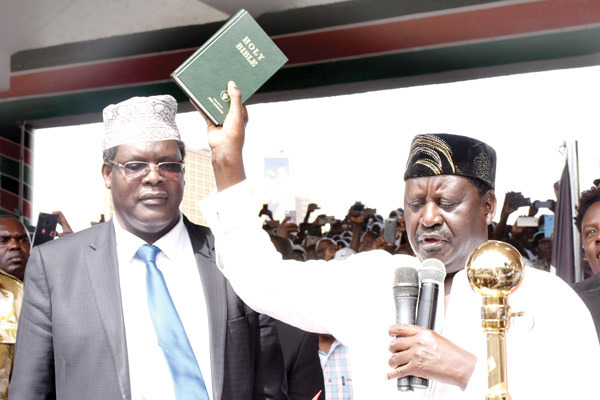 In his new book : Treason :The Case Against Tyrants and Renegades, Miguna said Raila’s plan was to mobilise a million strong crowd for the swearing-in ceremony and then tell them to camp in CBD for 90 days. “We recommend that we make Nairobi the theatre of operations; that we don’t disband after the swearing-in,” Miguna writes, recalling a presentation he made at a strategy meeting attended by Raila and NASA chiefs. According to the plan, during the processions - NASA would ensure protesters have enough clean water, portable toilets and mobile medical clinics - complete with International Red Cross and Doctors without Borders personnel. “Let’s cripple all business and other activities in Nairobi through peaceful pickets and disruptive events for weeks on end,” Miguna writes. “However, in case the Jubilee regime reacts by placing the NASA and/or NRM leadership under arrest, detention or kills anyone of us, we must appeal to our supporters to increase the level of positive popular activities and protests with the aim of removing Uhuru Kenyatta and Deputy William Ruto from power - by all means necessary,”he wrote. He said the final grand plan was to march to State House and evict Uhuru and his family and “teach them a lesson” for rigging the election.